Bachelors who are in their mid 30s who struggle to get a bride for them would get a burning sensation in their tummy when they see a 40 year old man marrying a girl in her 20s. But when it comes to a certain 64 year old uncle who romances with a 33 year old actress and a 27 year old actress simultaneously, these 30 year old men will only admire the style and charisma of the man on the screen. That is Rajinikanth for you. Lingaa is a movie that has got mixed reviews from people. Rajini fans are going gaga over it and the so called critics call it a boring screenplay work. People will always have different opinions. This version of mine is neither for or against the movie. This review is an admiration of each and every frame and showcases what Chronicwriter understood from the movie. The movie opens with the letters S U P E R S T A R - R A J I N I projected on the screen and the audience erupt in joy. Newspapers are torn and thrown in the air. The theatre experiences tremors that could be measured on the Richter scale. The Introduction for Rajini is the first of its kind in Tamil cinema. Henry Olonga - the Zimbabwe bowler who was once molested by the Little Master does a cameo role in the opening song where Super star is introduced. Super star is accompanied by the Russian belly dancers from Gemini circus. As usual the mesmerising voice of SPB sets the tone for the perfect introduction song. The68 year old Guinness world record holder who has sung more than 40000 songs still sings like a man in his 20s. Rajini's make up artist has done a great work on his face. Rajini indeed looks dashing. Once the introduction song is over, Rajini and his 4 friends are arrested for bad choreography. They are all thrown inside the same cell in the police station. Anushka who was last seen in the same police station a few years back in the movie Vaanam, again makes an entrance inside the police station; this time to bail out Rajinikanth. Rajini steals the chain from Anushka that Simbhu stole in Vaanam movie. Astonished by his stealing skills, Anushka challenges to go one step ahead and steal a gold necklace from Lalitha jewellery. Together they carry out the most amazing gold robbery that has ever been captured in Tamil cinema History. For the first time in Tamil cinema, Rajini freezes the spy cameras and then steals the necklace. Immediately Rajini becomes Jack Sparrow and becomes the captain of a ship. The Mona Mona Gasolina song is played in the background and Rajini starts dancing. The song has the same chord progression of Arima Arima song from Endhiran. I guess A.R.Rahman was so lazy that he just copy and pasted the same song and rearranged some music instruments to come up with this song. This time, Rajini dances better and he is not arrested. 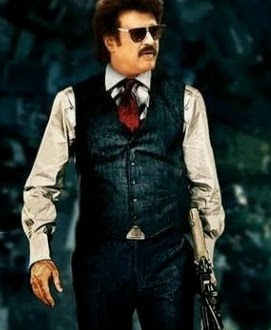 Now as one Rajini is exposed for more than 30 minutes, director KSRaviKumar decides to introduce the next Rajinikanth. The book publishers of "The Hero with a thousand faces - Joseph Campbell" approached KSRavikumar before the movie and told him that the book was not selling properly and pleaded with the director to promote the book in his next movie. So the second Rajinikanth is made to read this book. Rajini shows his amazing reading skills in a moving train. The Pirattes who danced with him in the ship enter this train and fights with Rajinikanth. After the famous train fight scene from Endhiran, Ravikumar decided to use a train fight scene in this movie to show that he can take a fight scene better than Shankar. The technology used in the fight scene is a mixture of Spiderman stunts + Jackie Chan stunts + Jetix stunts and Super Mario stunts. The audience erupt again inside the theatre and tremors are again experienced. During the course of the fight Rajini's hair gets disturbed. So in between the shots, the make up artist wipes away the sweat and applies powder on his face and also combs his hair and applies hard Gel on his hair. After the fight is over, superstar's hairstyle again becomes perfectly normal. The second Rajinikanth is now introduced as a king and the Mysore Palace is shown in the background and they say that it is Lingeswaran's palace. The villain is a Louis Philippe model. Rajini suddenly decides to build a dam to solve the Cauvery issue and because of that decision the Louis Philippe model suddenly decides to copy what Raghuvaran did in the movie Muthu. As a result the King donates his kingdom and his palaces to the peasants and goes into a No-witness place ( Kann Kaana idam) to become a puttu master. After some time the peasants of the kingdom decide to eat puttu and they go to the No-witness place and eat the puttu made by the puttu master. At this point of time Lingeswaran decides to utter 8 punch dialogues which he read in the book by Joseph Campbell. Tremors in the cinema hall again. Sonakshi Sinha is given the same saree that Nithyananda wore in the movie he acted with Ranjitha. The same sleeveless rendition of the saree makes the men in the cinema hall to miss heart beat. She is last seen chasing the same train in which the king was first seen reading the book. Rajni's dressing in the entire movie is top notch. His tuxedos, Sherwanis and his suits are a treat to watch. The Climax of the movie is the best climax in Tamil cinema history. Jacki Chan is known for his stunts without a dupe artist. Jackie Chan holds the record for the longest jump from a cliff and landing on a parachute. The measured distance was 200 feet. Rajinikanth bettered this record and jumped 400 feet in a bike and landed on top of a parachute. Because of this unbelievable jump rumours start to spread that he would have taken performance enhancement drugs to achieve this feet. So to clear this suspicion he is taken for interrogation by Finishing Kumar aka KS Ravikumar. Note: Only those who have seen the movie, will understand this review. Others will not understand this review at all. Additional Note : I am a thalaivar fan. People have either criticized the movie or praised the movie. I did not want to do any one of that. I just wanted to write a review in a manner that would be understood by those who have seen the flick.